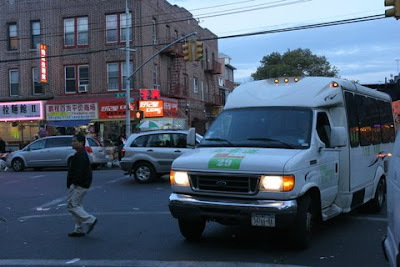 Sunset Park Chronicled and The Brooklyn Ink have articles about the commuter vans that help many Sunset Park residents travel between Brooklyn and Manhattan Chinatowns. Check them out. They also go to Flushing, so they're an easy (and more direct way) to get to Queens. Thanks for spreading the story, guys! There's more where that came from at The Brooklyn Ink. Is it really faster than the subway? Anyone know? With traffic, that seems unlikely. It's not a realistic option for someone with a child anyway, but I'm curious. I think you have to be Chinese to use them because each time I have tried to flag one down, they refuse to pick me up.